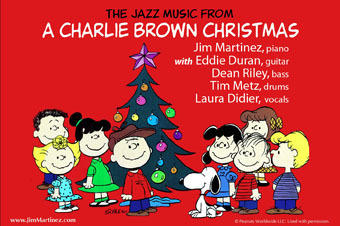 It’s all about the spirit tonight – the spirit of jazz, the spirit of Christmas, and the spirit of Charlie Brown – as Jim Martinez and his band pay tribute to the music of “A Charlie Brown Christmas.” Jim has performed with such jazz notables as Lionel Hampton, Christian McBride, Russell Malone, Roy Hargrove, the Nelson Riddle Orchestra, and Benny Golson. He’s recorded a dozen albums, including a tribute to Oscar Peterson, a tribute to Edvard Grieg, and a series of “Jazz Praise” albums that feature straight-ahead jazz arrangements of church hymns. After Dave Brubeck heard Jim’s melding of “Amazing Grace” and “Take Five,” he wrote to Jim: “Your playing and all the musicians, including your vocalist, sound wonderful.” Jim has assembled a talented band for tonight’s show, with Eddie Duran on guitar, Dean Riley on bass, Tim Metz on drums, and Laura Didier on vocals. Jim began studying classical music at the age of four in his hometown of Sacramento. He’s a regular at the Lionel Hampton Jazz Festival in Moscow, Idaho, and has played at St. Peter’s Church in New York City and The Basement Jazz Club in Sydney, Australia. He recently served as pianist and musical director for Joan Rivers and Bob Newhart at Harrah’s in Lake Tahoe, and is also the Minister of Music at River Valley Church in Rancho Cordova. From the first chords of Vince Guaraldi’s classic “Christmas Is Coming,” you’ll feel the spirit of Vince and Jim and Christmas and good ol’ Charlie Brown.